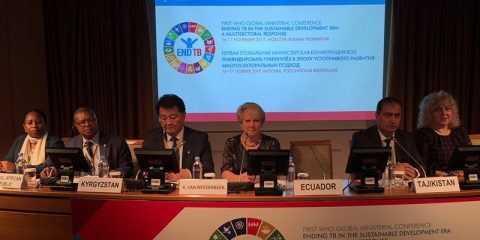 Yesterday the WHO Global Ministerial Conference “Ending TB in the Era of Sustainable Development: A Multisectoral Response” was held in Moscow. Ministers of Health, Finance and other sectors were present to discuss the global TB epidemic. The conference was opened by president Vladimir Putin of the Russian Federation. The goal of the Ministerial Conference is to accelerate the required momentum for the coming year, in which global TB control must take major steps to stop the TB epidemic. Next year in September, for the first time in the history of the United Nations, the fight against tuberculosis will also be discussed at the highest political level. Tuberculosis is the deadliest infectious disease in the world with 1.7 million deaths a year. Multidrug resistant tuberculosis is on the rise and poses a worldwide threat to public health. Despite the availability of new drugs and shorter regimen, the introduction and scale up of these innovations are held back by weak health systems in the high burden tuberculosis countries. Political and professional determination of the highest level is required to overcome technical, political and organizational challenges. During the ministerial meeting in Moscow, Kitty van Weezenbeek gave insights into the Dutch TB expertise and experience. The Dutch multisectoral approach ensures that we do not lose patients in the cracks of the system. This is achieved through an advanced surveillance system and the way different sectors, such as public and private health, migration and the judiciary system, complement each other to be effective in the battle against tuberculosis. The renowned Dutch tolerance also helps: every patients is treated equally, regardless of their background, race, religion, legal or illegal status. The Moscow Ministerial Conference lifted the fight against TB to the necessary political level and emphasized the importance of a multisectoral approach. It also pointed to a special role for BRICS in stepping up their research to innovative solutions.